In late August and September 2016, Raging Grannies Margie Heller, Nancy Nelson, and Deena Romoff and Veterans for Peace Maeve Aeolus, Rusty Nelson (husband of Nancy), and George Taylor protested oil and coal trains moving through Spokane and the contribution of those pipelines-on-wheels to global climate change [1-6]. Police handcuffed and booked into jail these Spokane Climate Protectors assisted by Direct Action Spokane, and cited them with the misdemeanor charges of second degree trespassing and obstructing or delaying a train on Burlington Northern Santa Fe (BNSF) rail lines. At their pre-trial motion hearing on Monday, June 26, at 1:30 pm in Room 5 of the Public Safety Building, at 1100 West Mallon Avenue in Spokane, Washington, their attorney Eric Christianson will argue, before Spokane County District Court Judge Debra Hayes, that the six activists have exhausted all other legally viable options, and that their direct actions were thus necessary to halt climate change [7, 8]. Judge Hayes will decide whether she will allow their “necessity defense.” Recent, Northwest climate activist, court cases of the Delta 5 oil train blockaders in Everett, Washington, and the first of five multi-state, tar sands pipeline valve turner trials in Skagit County, Washington, have rejected this motion. After a previous postponement and if Judge Hayes assents, three nationally recognized experts on climate change plan to testify in court about the dangers and impacts of transporting volatile oil by rail through Spokane. Canceled since May 19, when the Spokane County court postponed, without explanation, the motion hearing to consider the necessity defense of the Spokane Climate Protectors, the Witnesses for the Climate public presentation has rescheduled to 7 pm on Monday evening, June 26 [10-12]. 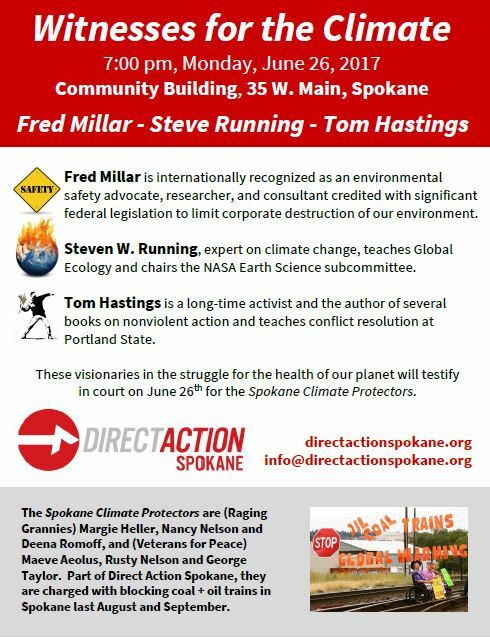 At the Community Building, 35 West Main Street in Spokane, three experts will speak about the necessity to defend rights to a healthy climate, through non-violent, direct actions stopping coal and oil train traffic. They may testify at the hearing earlier in the day, on behalf of the necessity defense of the fossil fuel train-blockading Spokane Climate Protectors. * Fred Millar is internationally recognized as an environmental safety advocate, researcher, and consultant, and credited with significant federal legislation to limit corporate destruction of the environment. * Steven Running is an expert on climate change, teaches global ecology at the University of Montana, and chairs the NASA Earth Science subcommittee. * Tom Hastings is a long-time activist and author of several books. Event organizers of Direct Action Spokane request that supporters attend this free event instead of the court hearing, in deference to the judge’s disposition. Please share this event alert, and participate in Sandpoint carpools departing without a lead volunteer from the northeast corner of the free, downtown Sandpoint, parking lot, across from the Farmin Park clock, at 5 pm sharp on Monday, June 26. 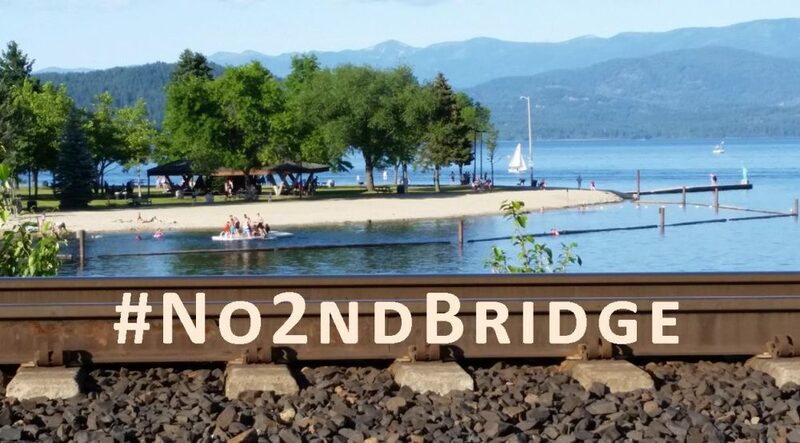 On Saturday, July 29, from 11 am to 1 pm, North Idaho Resistance Movement, 350Sandpoint, and Wild Idaho Rising Tide (WIRT) will host the Spokane Raging Grannies and Veterans for Peace who peacefully blocked BNSF rail lines in Spokane last fall . Their presentation held in the Rose Room of the Gardenia Center, 400 Church Street in Sandpoint, will discuss their arrests and court case, and will include a question-and-answer session followed by a potluck. Please bring a food item to share at this free event, open to the public and welcoming donations to cover expert witness expenses. For more event information, contact Sparrow Ivy at 208-627-9084. WIRT will post and send another announcement, closer to the date of this event, with further descriptions and a flyer. Thanks!